Mount Tomorr Lies to the northeast of Çorovodë at a height of approximately 20-25km and has the proud status as a National Park. The national park is spread over a surface of 4,000 acres. The park is bordered in the north by Tomorr and in the west by the road between Berat and Skrapar. The highest point of Mt. 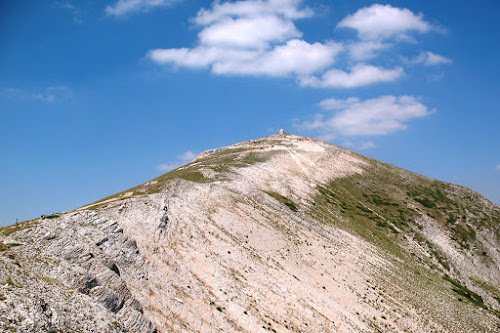 Tomorr is 2415.7m above sea level and this point is called Çuka Partizane. The national park is beautiful in all seasons, but especially with snow in the winter. The Western face of the mountain is the most wooded. Its forests are full of beech and pine trees. Beech trees grow mainly at 1000-1200m above sea level and Pine tress above 1600m. The park is characterized by a large diversity of wild animals that live in certain parts of the forests, especially bears. Closer to the villages you might find wolves, foxes, and badgers, while in the surroundings of the forests and near farms, you may find wild pigs, wild rabits, etc. On the top of rocks you may find herds of wild goats and in the inner park: foxes, squirrels, di erent types of reptiles (snakes, vipers, and lizards, etc), in the streams and ponds you can see di erent types of insects, dragonflies, butterflies etc. The birds are represented by di erent types of eagles, and other predators, some types of woodpeckers, wild doves, wild turkeys – which are an endangered species, as well as various types of wild birds and pheasants. To get to Mt. Tomorr you can take two roads: The shorter road from Pronovik to Mt. Tomorr with a distance of 10km or you can take the longer road from Çorovodë to Gjerbës to Mt. Tomorr with a distance of 25km. At the altitude of 1,200 m above sea level you will find the tomb of Abaz Aliu. His tomb is considered to be a holy and worshiped place. Every year from August 20th to August 25th a huge relgious festival is organized on the top of Mt. Tomorr by the Bektashi sect to celebrate their most important holiday. But the festival is open to members of all faiths and it is common to find a mix of religous identities celebrating together.